See publication in WOUNDS here. The purpose of the study was to evaluate the wound healing effects of Acapsil and to compare it to antibiotics and antiseptics. The study included a wide range of wounds and ulcers, which were severely colonised to infected. The comparators were the topical antibiotic Gentaxane, which is a combination of an absorbing powder and the antibiotic gentamicine, and the antiseptic Ioddicerin, which is a combination of iodine and DMSO, where the latter is used to improve tissue penetration. The study included a total of 266 patients with primarily trophic ulcers caused by venous insufficiency of lower extremities and diabetes, carbuncles, phlegmons, infected heat burns of degree III – IV, and infiltrations of postoperative wounds. Acapsil, Gentaxane and Ioddicerin were applied once daily to the wound surface and the edges until the wound was clean, i.e. free from necrosis, pus and fibrinogenous thickenings. For each patient, it was recorded when the wound reached a clean wound, onset of granulation and onset of epithelialisation as well as the number of bed-days from start of application until the patient was able to leave the hospital to continue treatment at a walk-in clinic. 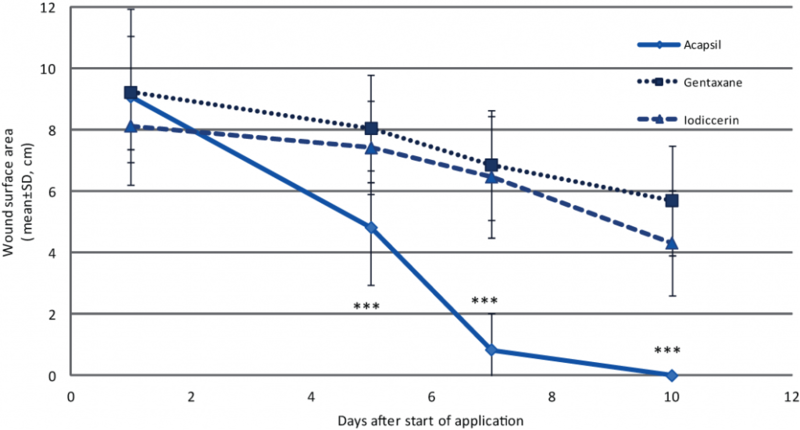 For a subgroup of patients with abscesses, carbuncles and post-operative infected wounds, the wound surface area was measured at 4 time points during the first 10 days after start of application. 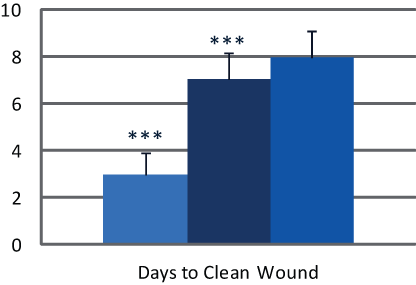 Days (mean±SD) to reaching the three Wound Healing Stages in patients following application of Acapsil (n=88), Gentaxane (n=90), or Ioddicerin (n=88). 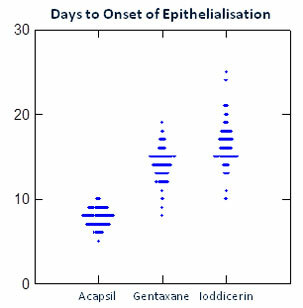 wound stage, onset of granulation and onset of epithelialisation and bed-days following application of Acapsil (n=88), Gentaxane (n=90) or Ioddicerin (n=88). For the entire patient group, the number of days (mean±SD) to reaching a clean wound was 3.0±0.9 for Acapsil (n=88) compared to 7.0±1.2 and 8.0±1.1 for Gentaxane (n=90) and Ioddicerin (n=88), respectively. Acapsil thus reduced the time to reaching a clean wound by 57% and 62%, respectively. The products were used until reaching a clean wound and days to clean wound therefore also reflect number of days of application. 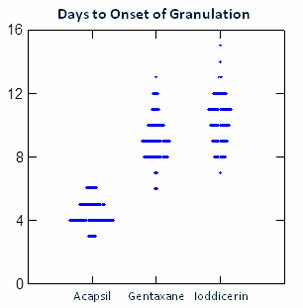 Days to Onset of Granulation were for Acapsil, Gentaxane, and Ioddicerin: 4.5±0.8; 9.2±1.4; and 10.3±1.5 days, respectively, and days to Onset of Epithelialisation were: 7.8±1.1; 14.1±1.9; and 16.4±2.7 days, respectively. A sub-group analysis of patients with diabetic foot and venous leg ulcers found that these demonstrated the same pattern of healing. Percent reduction in hospitalisation-days by Acapsil compared to topical antibiotic and iodine. The number of hospitalisation-days was 14.6±5.6 for Acapsil, 21.0±10.7 for Gentaxane and 24.0±7.9 for Ioddicerin (p<0.001). Compared to Gentaxane, patients receiving Acapsil had a 31% reduction in number of hospitalisation-days and compared to Ioddicerin 39%. Wound surface (sq. cm) for Days 1 to 10 following start of application. N=30 per group. Each group included 30 patients and the distribution of wound types was 80% carbuncles, abscesses, and cysts and 20% infected wounds for all three groups. For the subgroup of patients with carbuncles, abscesses and post-operative infected wounds (n=30 per group) the wound surface area was at Day 1 the same in the three groups, but at Days 5, 7 and 10, the Acapsil group had significantly smaller areas than the other groups and reached wound closure significantly faster. There were no significant differences between Gentaxane and Ioddicerin. Acapsil did not cause any severe adverse reactions, irritation, bleeding or contact sensitivity. Thomas (2006) found that the critical aspect of the wound healing process for wounds demonstrating delayed healing is to reach the state of a clean wound bed, i.e. free from critical colonisation and inflammation. Once this state has been reached, the healing process will proceed and the time to wound closure is more or less constant. 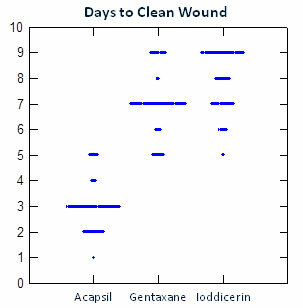 Duration of wound healing phases for each of the 3 groups and percent reduction by Acapsil compared to Gentaxane. 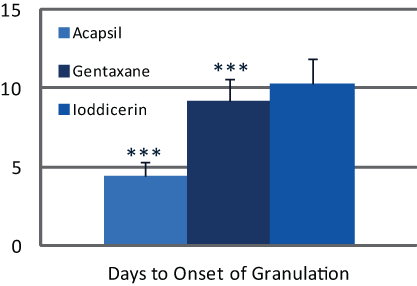 The present study found that Acapsil, compared to Gentaxane, reduced the time to a clean wound by 60% and the time from a clean wound to onset of granulation and epithelialisation by 32%. In contrast, the time from onset of epithelialisation to the patient being able to leave the hospital was constant. These data support the theory by Thomas (2006) that reducing the time to a clean wound has a substantial impact on the overall wound healing process, but the data also indicate that the transition from the inflammatory to the proliferative wound healing phase is less distinct and that Acapsil also accelerates at least the early stages of the proliferative phase. 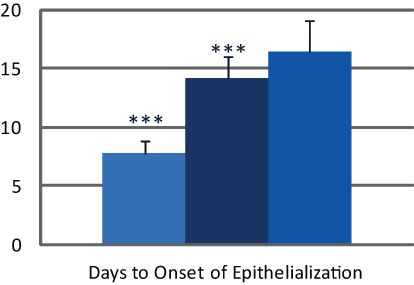 The study did not follow the individual wounds until closure and the actual duration of the complete proliferative phase is therefore not known, but Acapsil reduced the time to onset of epithelialisation by approximately 7 days compared to Gentaxane and the Acapsil patients left the hospital 7 days earlier than patients receiving Gentaxane, so the data indicate that Acapsil mainly achieved its effect by accelerating the transition from the inflammatory phase into the proliferative phase. Acapsil reduced the time to achieving a clean wound by 60% compared to the topical antibiotic Gentaxane and the iodine-based antiseptic Ioddicerin. Furthermore, Acapsil reduced the number of hospitalisation-days by 31% and accelerated the rate of wound closure. Together, these findings demonstrate that Acapsil assists the wound healing process and is safe to use.